Lord of the temple is praised in the hymns of Saints Sundarar and Tirugnana Sambandar. 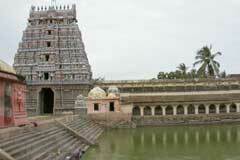 This is the 125th Lord Shiva temple on the southern bank of Cauvery praised in Thevaram hymns. 29 day Masi Magam Brammotsavam in May-June with the event of the opening of the closed doors of the temple in the past, when Lord goes to sea on the Magam star day and the procession of 63 + 10 celebrated Nayanars, procession of Lord in Kailash Vahan; 10 day Aadi Pooram in July-August, a festival dedicated to Mother Ambica; Vinayaka Chaturthi in August-September; Skanda Sashti in October-November are the festivals celebrated in the temple. There will be huge devotee crowd on Pradosha days – 13th day of New Moon or Full Moon days. Special pujas are performed in the temple for Lord and Ambica on Deepavali, Makar Sankranti, Tamil and English New Year days. 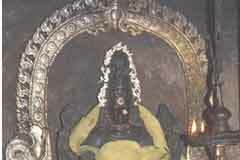 Lord Shiva is a swayambumurthi in the temple. 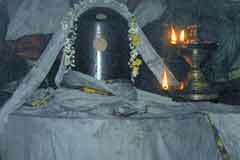 Two time puja is dedicated to Lord Maragatha Linga in Thiagesar shrine installed by Indira. The fruits in the Vanni tree are long with thorns on one side and round on the other side without thorns. The Navagrahas-nine planets are with the same face individually in a line facing Lord and Ambica to see their wedding darshan. The temple is open from 6.00 a.m. to 11.00 a.m. and from 5.00 p.m. to 8.30 p.m.
Sri Thiru Marai Kadar Temple, Vedaranyam, Nagapattinam district. According to history of the place, Lord Vinayaka in the West Tower (gopuram) entrance tossed with one leg a demon woman who attempted to kill Lord Sri Rama. 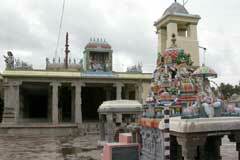 The temple has separate flag posts-Kodi Maram for Lord, Ambica and Lord Vinayaka. It is the staunch faith of the people that hardships any nature caused due to sins committed, adverse serpent aspects, evil spells would vanish if the devotee surrenders to Lord in the temple. A bath in the Manikarnika spring blesses with the benefit of bathing in holy rivers as Ganga, Yamuna, Narmada, Sindh and Cauvery. Even sins of high severity as Brahmmahathi caused by murder will disappear. The worship also brings them the benefit of doing charity, performing yoga and penance for a long period. The sea at the eastern side of the temple is known as Aadhi Sethu. Bathing in this sea once is considered equal to 100 baths in the sea in Rameswaram. Thousands bathe in the Kodiakarai Aadhi Sethu and Vedaranyam sea on Thai New Moon day in January-February, Aadi New Moon day in July-August, Mahalaya New Moon day in September-October and finally at Mani Karnika and worship Lord and Mother in their wedding form seeking child boon, education and wisdom, prosperity and healthy life. They are blessed with happy mental peace, employment opportunities promotions in jobs and progress in professions. 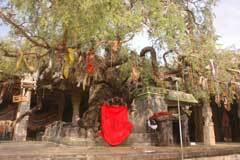 Devotees place cradles in temple tree for child boon. Those aspiring for marriage offer Wedding Garlands to Lord and Mother. They perform necessary remedial pujas for various adversities they face. Offering vastras and abishek with sandal paste, cosmetic and turmeric powders, oil, milk, curd, rose water, green coconut, sacred ash, panchamirtha etc. Many organize feeding-Annadhana. They also offer nivedhana to Lord and Mother and distribute to visitors. Many contribute for the renovation of the temple. 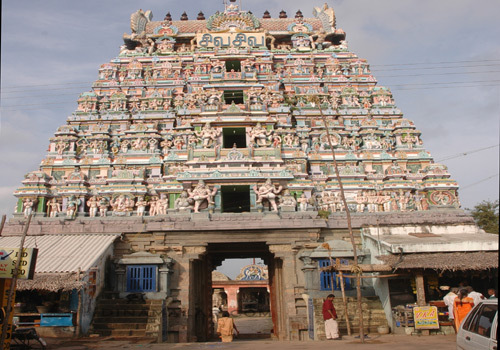 On their journey to various Shiva temples spread over the state, celebrated Saivite Saints Tirugnana Sambandar and Tirunavukkarasar (Appar) came to Thiru Maraikadu Temple. They sung pathigams-set of 10 verses- at each temple in praise of Lord Shiva. They were shocked to see that the main entrance of this temple was closed. They also saw devotees entering the temple through a side entrance. They enquired with the priests how this happened. 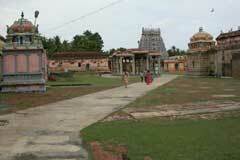 They were told that the Vedas worshipped Lord Shiva here and returned after closing the door. Hearing that Vedas, the holy scriptures of land themselves worshipped the Lord here, Gnasambandar requested Tirunavukkarasar – Appar to sing a hymn on Lord to open the doors. Appar, tears flowing from his eyes sang ten verses beginning with line “Pannin Ner Moshiyal” and begged Lord to open the doors of the temple. Excited by the graceful response of the Lord, both entered the temple through the main entrance and worshipped Lord. While coming out, Appar wished Gnanasambandar to sing a hymn so that doors could be opened and closed for the worship of the devotees as in all temples. Child saint Sambandar sang a Pathigam – 10 verses – beginning with the line “Chathuram Marai” closing the door. 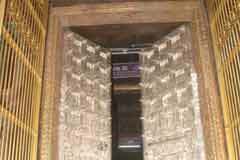 Since then, main doors of temple began to function in usual manner as in other temples. Mother Goddess is praised as Veda Nayaki, Yazhai Pazhitha Mozhiyal meaning that her voice defeats the sweetness of Veena in Tamil and Veena Vadha Vidhooshini in Sanskrit. This glory of Mother Ambica is praised by Acharya Sankara in the 66th verse of his celebrated Soundarya Lahari suggesting for gaining excellence in Music. The temple is the second in the rank of Saptha Vidanga Sthalas of Lord Shiva. 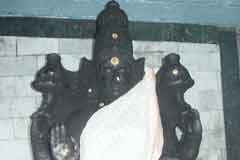 The Thiagaraja idol in the temple was earlier gifted to emperor Mushukunda Chakravarthi. The dance of Lord here is praised as Hamsa Natana. This is a very ancient Shivasthala in the state. Of the 64 Shakti Peetas of Ambica glory, the peeta in the temple is praised as Sundari Peeta. 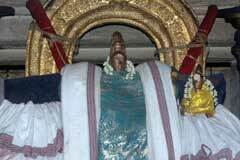 Presiding deity is also known as Marai Kadu Urayum Manalar – Lord having His home in Maraikadu. Saraswathi in the temple has no Veena in her hand. All the 63 Nayanmars and 10 Thogayara Nayanars – total 73 – are in idol form in the temple. Four Vedas- Rig, Yajur, Sama and Atharva had worshipped Lord Shiva in the temple. This is the temple where Lord granted sage Agasthya His wedding darshan. Great emperors Manu, Mandadha, Dasaratha, Lord Rama, Pandavas, Mahabali were blessed by Lord. Of the 16 Sabhas-Durbars of Lord Shiva, the temple ranks 12, praised as Deva Bhakta Sabha. The Kolaru Pathigam of Gnana Sambandar used by many devotees in their daily prayers for relief from the adverse effects of planets was sung from this temple. Lord Mela Kumara-Muruga is praised in the Tirupugazh hymns of saint Arunagirinathar. Sage Paranjothi Munivar, author of Tiruvilayadal Puranam speaking Lord Shiva’s plays for the benefit of His devotees, was born here. It is also noteworthy that though the water outside the temple complex is salty in taste, the water within the complex only is sweet and palatable. Drinking water supply to this area is made from the water in the temple only. Holy Vedas Rig, Yajur, Sama and Atharva came to this place in human form and stayed at Naalu Veda Pathi near by. They gathered flowers for their worship from Pushpavanam. Sooner Kaliyuga was born they felt that days to come would not be safe, expressed their feelings to Lord and left after closing the doors. Even now, it is believed that plants, trees continue to worship Lord here. After the closure of the main entrance, people used the other entrance called Thitti Vayil to worship Lord in the temple. After the visit of the great saints Gnana Sambandar and Appar and the normal functioning of the doors, people are now using the main entrance and that the place was named Vedaranyam as Vedas worshipped here, are the facts available from history. Miracle Based: Lord Shiva in the temple is Swayambumurthi. The fruits of the Vanni tree in the temple are long with thorns on one side and are round without thorns on the other side. Convenient bus facilities are Available to Vedaranyam from Thanjavur, Nagapattinam and Tiru Thurai Poondi. Vedaranyam is 45 km far from Nagapattina, 35 from Tiruthuraipoondi, 63 from Tiruvarur and 12 from Kodiakarai.